Few places on earth are as blessed as the fabled Hawaiian Islands, with their incredible natural beauty, perfect climate, and world-class vacation attractions. Explore all Hawaii has to offer at the amazing ports below! Each port has something unique to offer. Hawaii’s capital is considered the jewel city of the Pacific. From Diamond Head and the world-famous beaches of Waikiki, to the inspiring memorials of Pearl Harbor and the Punchbowl National Cemetery, to the only royal palace ever constructed on U.S. soil. 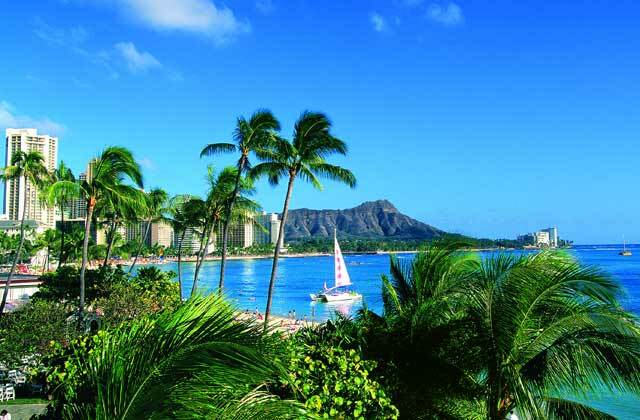 Drive along Ala Moana Boulevard to view the hulking dormant volcanoes Diamond Head and Koko Head. Visit Hanauma Bay. Formed during Oahu’s last eruption, the area is now a marine preserve with extensive underwater life. Honolulu is famous for its Japanese cuisine, so be sure to have a Japanese meal while you are on this island! Dine at a Hawaiian Luau! Partake in a extraordinary evening of traditional Hawaiian food and entertainment. Pack your hiking shoes and hike to the Summit of Diamond Head crater with a naturalist guide. Experience all the islands of Polynesia in one place at the Polynesian Cultural Center. 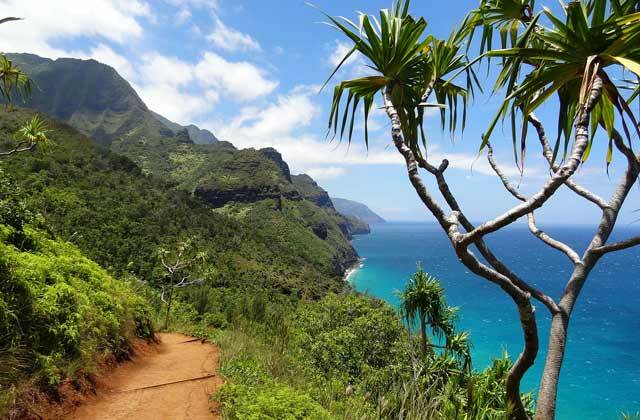 The Garden Isle of Kauai is the tropical paradise that dreams are made of: a land of towering ocean cliffs and impossibly green valleys, pristine rain forests and cascading waterfalls as well as some of the world’s most photographed beaches. Explore the island from a bird’s eye view in a helicopter ride over Waimea Canyon. Along the way, keep your eyes open for familiar scenery from popular movies, including Jurassic Park and Raiders of the Lost Ark. Explore the shores of Lumahai Beach and Bali Ha’i Mountains, made famous in the musical South Pacific. Experience Waimea Canyon, the Grand Canyon of the Pacific. The canyon’s dramatic size, combined with the reds and browns of its exposed volcanic rock and the blues and greens of lush tropical vegetation, creates a truly unforgettable sight. How about a romantic kayak ride? Board a double kayak for a two-mile paddle to the upper reaches of the famous Wailua River. Along the way, stop and make the hike to the Uluwehi Falls, where you can have lunch and relax in the beauty of Hawaii. If you see any fins along they way, it just might be a dolphin! Looking for a little more adventure? Rent a four-wheeler and go four-wheeling through remote, winding back roads into lush forests abundant with exotic foliage. The Hawaiian phrase “Maui No Ka Oi” means “Maui is the best.” You’ll agree, after a visit to the enchanting Valley Isle. Explore the old whaling town of Lahaina and the nearby West Maui Mountains. Or explore Haleakala National Park and its 10,000-foot volcano crater. Then travel the road to Hana and experience a true taste of old Hawaii. Or snorkel off the emerald island of Lanai, where you’ll delight in pristine reefs and colorful marine life. Explore Haleakala Crater, a dormant volcanic crater Hawaiians once considered one of the most sacred places on the island. Haleakala Crater is the highest point on Maui at 10,023 feet above sea level, so you’ll have unparalleled views of the island from the summit. The volcano last erupted in 1790. However, evidence of volcanic activity from long ago abounds in the stunning streaks of gray, red, yellow and black that mark the flow paths of lava, ash and cinder. Snorkel with dolphins and sea turtles on the Lanai Wild Dolphin and Snorkel Adventure. Explore the varied flora of the beautiful Iao Valley State Park and the Maui Tropical Plantation. Attend a Luau. The Kalua pig will cook all day on lava rocks in the Imu pit, where you will gather for the Imu ceremony. Then sit back and enjoy Hawaii’s delicacies and authentic Polynesian entertainment. No Hawaiian experience is complete without this tradition. Go on a whale watch and experience the grace and beauty of one of the earth’s largest living creatures, the humpback whale. Hilo, also known as Hawaii’s Big Island, The Orchid Isle, and The Volcano Island is4,050 square miles and home to the snow-capped, 14,000-foot peaks of Mauna Loa and Mauna Kea, the fiery landscape of Hawaii Volcanoes National Park, vast macadamia nut plantations, black-sand beaches, orchid-filled forests and posh resorts. Explore the wonders of Kilauea Volcano up close on a walk through Hawaii Volcanoes National Park. You’ll be amazed by the incredible beauty and power of this active volcano. Take a helicopter ride above the big island to experience the beauty and ferocity of Hawaii’s active volcano. You’ll view skylights, volcanic cinder cones, and possibly even molten lava. Experience Lava Tree State Park and swim in a reef-protected coastal lagoon that is home to numerous tropical fish and the occasional green sea turtle. Experience a volcano up close and personal on the Kilauea Volcano Bike Adventure. Ride through the rainforest and lava frozen in time on a 21-speed mountain bike. Walk through the tropical botanical garden, where you will see native plants, giant trees, tropical vegetation and endangered plant species. Try a roasted pig at a Hawaiian luau. The clear waters of Kailua are perfect for diving, snorkeling, and deep-sea fishing. Kailua is a charming resort village that lies in the heart of the Kona Coast. Because two other “Kailuas” exist within the state, the Big Island’s Kailua is often called Kailua-Kona for clarity. Kealakekua Bay is one of the best snorkeling spots on the island. This is where Captain James Cook lost his life; the area is a state park and conservation site, teeming with undersea life. It’s a great place for both experienced snorkelers and novices to explore the marine world. Explore Kona’s reef on an adventure to the underwater world!. You’ll travel along a natural coral reef bed that is home to a multitude of tropical marine life. Look closely and you may catch glimpses of moray eels. Be sure to pack an underwater camera! Soar over the west side of the Big Island via helicopter and discover the lush green valleys, cascading waterfalls, and rugged shorelines around Waipio Valley. Cruise the coast in search of the local spinner dolphins on your way to a reef where you snorkel and see the tropical fish and coral reef. Go fishing in the billfish capital of the world. The calm, deep-sea fishing grounds off the coast of Kona are teeming with marlin, yellowfin tuna, mahi mahi, wahoo, and short-nose spearfish year-round. Looking for a more relaxing adventure? Play a round of golf on one of Hawaii’s many beautiful waterfront courses. Tour the historic plantation town of Kohala, then hike the Pololu Valley where you’ll experience the breathtaking Kapoloa Falls. Take a walking tour of dozens of Kailua-Kona’s charming and fascinating historic sites. Enjoy stories of Kona’s colorful characters and the places they inhabited. Experience the treasures of the King’s summer palace as well as the beautiful palace grounds. Be sure to try a cup of Kona coffee! This rich, smooth coffee is famous in Hawaii!